Lance Armstrong is locked in a war of words with the director of the Tour de France as he continues to fight claims he used blood-boosting drugs in 1999. The French newspaper L'Equipe alleged earlier this week that signs of EPO were detected in samples of Armstrong's urine given during the 1999 race. Tour director Jean-Marie Leblanc said: "What L'Equipe revealed shows me that I was fooled. We were all fooled." But Armstrong said: "To say that I've 'fooled' the fans is preposterous." 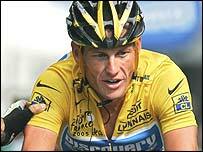 Armstrong had already issued a statement denying L'Equipe's claims, which were made on Tuesday. The seven-time Tour de France champion insisted he had never taken performance-enhancing drugs and said the article was part of a "witch hunt". But he chose to go on the offensive on Wednesday, hitting out at Leblanc and attacking L'Equipe. "Obviously, this is great business for them," said the 33-year-old American. "At the end of day, I think that's what it's all about - selling newspapers." Armstrong, who retired from cycling after winning his seventh Tour in July, also questioned the validity of testing samples frozen seven years ago and how those samples were handled since. "It doesn't surprise me at all that they have samples," he said. "Clearly they've tested all of my samples since then to the highest degree. But when I gave those samples, there was not EPO in those samples. I guarantee that." Armstrong charged officials at the Paris laboratory with violating World Anti-Doping Agency code for failing to safeguard the anonymity of any remaining 'B' samples it had. He also said he was considering legal action to discover who leaked the details of the test but admitted the cost and time of such action were prohibitive. "It would cost a million and a half dollars and a year of my life," he said. "I have a lot better things to do with the million and a half, and a lot better things I can do with my time." In Tuesday's edition of L'Equipe, four pages were devoted to the allegations against the American under the front-page headline "The Armstrong Lie". It said there were "characteristic, undeniable and consequent" signs of EPO in what it claimed were Armstrong's urine tests, carried out by France's national anti-doping laboratory in Chatenay-Malabry. The newspaper explained that the tests on the samples were carried out in 2004 because cycling's governing body did not start using a urine test for EPO until 2001. The laboratory said in a statement it had "conducted EPO tests on samples from the 1998 and 1999 Tour de France races" but added it could not confirm that any tests it had conducted belonged to Armstrong. However, L'Equipe insisted Armstrong was guilty of doping, appearing to have convinced Leblanc, who said: "For the first time - and these are no longer rumours, or insinuations - these are proven scientific facts. "Someone has shown me that in 1999, Armstrong had a banned substance called EPO in his body. He owes explanations to us and to everyone who follows the Tour." Armstrong was quick to respond to L'Equipe, which is owned by the same parent company that also organises the Tour de France. "I will simply restate what I have said many times: I have never taken performance-enhancing drugs," he said. "The paper even admits in its own article that the science in question here is faulty and that I have no way to defend myself. "They state: 'There will therefore be no counter-exam nor regulatory prosecutions, in a strict sense, since defendant's rights cannot be respected.'" While Armstrong maintains his innocence, the International Cycling Union has decided to keep a watching brief. "We have to wait and see if this is true," said Hein Verbruggen, president of cycling's governing body. "Only then will we be able to ask ourselves whether there should be any legal action and whether this is a further blow for cycling. "I have to say this is not pleasant but, for the moment, it only involves Lance Armstrong and France."